If two points ( x1, y1 ) and ( x2, y2 ) lie on the graph of f(x), the increment in x ( Δx ) is the difference between x2 and x1. Similarly, the increment in y ( Δy ) is the different between y2 and y1. Let f(x) = x^2 - x + 2. If x jumps from 3 to 3.2, what is Δy? Step 1: Enter x1 = 3 by tapping x, 1, =, 3 in order. 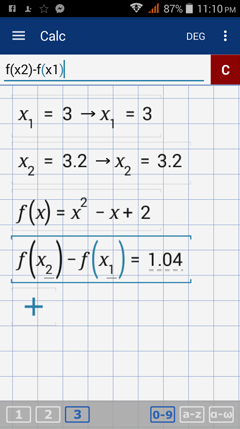 ​ Step 2: Enter x2 = 3.2 by tapping x, 2, = , 3.2 in order. ​Refer to the screenshot below.